And I thought I could write…. My grandmother has written a book… and it has been PUBLISHED!!!! So here’s my shameless proud grand-daughter promotion…. 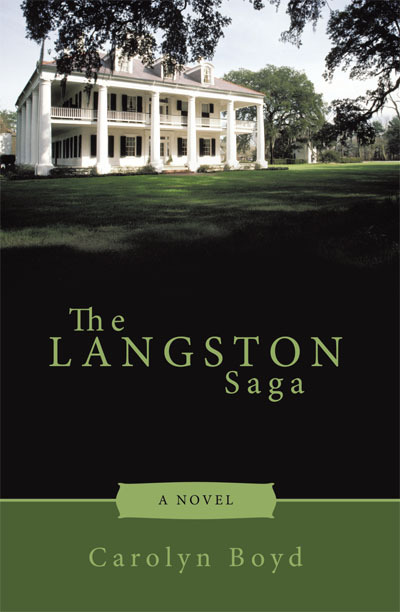 The book is called The Langston Saga. I could leave links and insist that each one of you go read the blurbs and check out the cover, but I am going to move it all right here so you can admire it lazily. Then I am going to leave links so you can go buy it. . .. Because I know you will want one. Charles Langston was four when his parents died and he went to live with his Aunt Sophie. He met Ben Dunn and Ellie Sorenson and the three forged friendships that would last their lifetimes. Charles and Ben fought with General Jackson at the Battle of New Orleans, and when they returned home it was with script awarding them a tract of land in Mississippi. They set about turning that wild land into a beautiful and productive plantation. Charles and Ellie married and had a son, Charles Matthew, Jr. (Matt). Ben married a beautiful woman from New Orleans and they had a daughter named Megan. In due time, Megan and Matt married and life was idyllic until the Civil War intervened to destroy an entire way of life. The South was stripped of its wealth and dignity and the Langstons faced losing everything they owned to the carpetbaggers. Matt went to Texas to look for land, and Megan managed to sell cotton that her father-in-law, Charles, had stored up before the War. She then sold the plantation and moved with their sons, Charles Matthew, III (Trey) and Patrick (Bubba), to the ranch Matt had purchased in Texas. During this time Megan met Salem McCord, and was drawn to him so strongly that she was terrified of the intensity of her feelings, and that she might do something to dishonor her family. Salem was a man of honor, and though he was very much in love with Megan, he, too, understood that they could only be friends. I thought so. Here’s a link so you can go right now and order a copy. Go right here to buy it. Do it, and I will make sure she signs it for you. I have connections like that, you know.